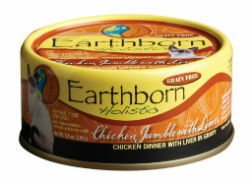 Boneless, skinless white meat chicken and aromatic chicken liver in a savory gravy sauce that provides a strong taste and aroma that cats crave. This grain and gluten-free dinner also includes chunky potatoes as an exceptional source of vitamins, minerals and beta-carotene, which supports a strong immune system. Designed with your cat in mind, this formula will give your cat the nutrition he needs to live a long and happy life.